Some receptacles when tested indicate they are ungrounded. Cables entering boxes or enclosures shall be secured by approved box connectors or cable clamps. Nonmetallic sheathed cables shall be protected from mechanical damage to a minimum of 1.5 m (5 ft.) above the ground. Covers shall be installed on all electrical boxes. Interior gas metal piping shall be bonded to the service ground by a minimum No. 6 AWG copper conductor. Notice of deficiency correction electrical contractor in Mississauga and Etobicoke. Panelboards shall have a complete directory identifying the circuits. Receptacle(s) mounted in the floor shall be relocated or replaced with receptacles and boxes approved for floor mounting. Where a grounding type receptacle is used to replace an ungrounded type, the receptacle shall be a GFCI class A.
Nonmetallic-sheathed cables used in wet locations or for direct earth burial shall be type NMWU. Incomplete or Unused wiring is required to be disconnected, removed or to made safe by terminating in approved enclosures. Cover plates are required on all boxes and devices. 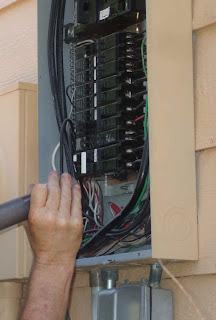 Covers should be installed on all electrical boxes and enclosures. Panel fillers are required to close the unused openings in breaker panels, panelboards, and switchboards.